Proposed developments in the French capital will continue the ongoing ruination of its classical beauty. Predictably, one of the signature policy disputes between the two candidates arose from a conflict of styles. Hidalgo vowed to promote the construction of high-rises, which she believed necessary for economic competitiveness. Without them, she argued, Paris would become a museum, like Venice. Her campaign promised architecture that would “rupture” Paris from its past. By contrast, “NKM” (as she is called) demurred. The buildings of Paris were historically low in height and classical; there was no inherent relationship between high-rises and economic dynamism; and anyway, Paris’s urban density was already twice that of New York’s. Nor did she favor rupture for its own sake. She proposed instead to turn disused metro stations into swimming pools. But Hidalgo won. NKM struck too many as an ice princess, out of touch with their concerns. An effort, for example, to project herself as a woman of the people resulted in a photograph of her using the city’s low-cost, eco-friendly bike-sharing service—with a $2,700 Bottega Veneta handbag in the bike’s basket. Like so much else written about new architecture, this is nonsense. The building does not evoke the urban fabric of Paris. To the contrary, as NKM correctly observed, the urban fabric of Paris is low and classical. The triangle is neither a classical building nor is it “like one”; it is antithetical in shape, scale, proportion, texture, material, and ornament to the principles of classical architecture, to say nothing of height. Not one such structure existed in antiquity. Nor do classical buildings feature “two levels of interpretation.” Nor do they have fine, crystalline silhouettes—nor, in fact, will the Triangle: in the architects’ depictions, it resembles a wedge of gray cheese. Hidalgo invited architects to submit additional plans to “reinvent” the capital in what she described as an “urban experiment of unprecedented magnitude.” Many of the winning projects share a similar aesthetic: they call to mind glowing egg cartons, or bathtubs, improbably sprouting fern fronds. The best that may be said of the designs is that they are thin, Green, and French. Times change, it’s true, and cities need renewal and modernization. 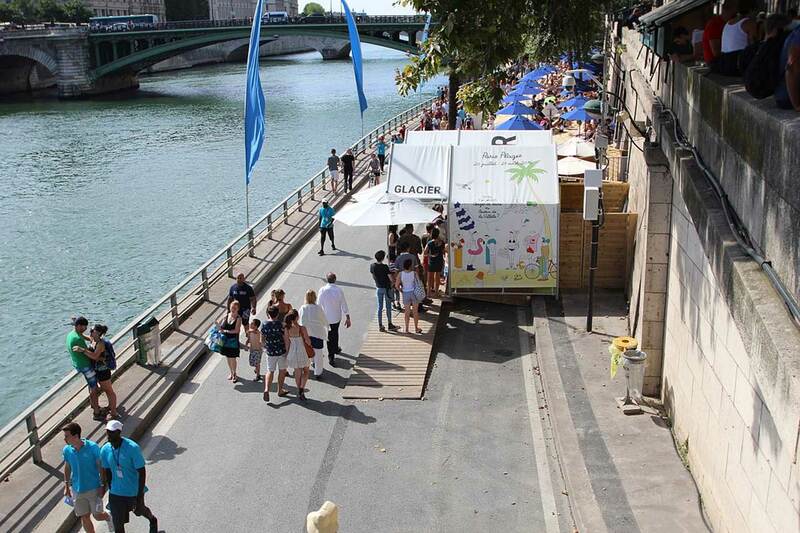 But it should be possible to do this without compromising a city’s beauty. And it has been done. In the mid-nineteenth century, the center of Paris was a claustrophobic warren of twisted lanes, a cradle of riots and cholera epidemics. Emperor Napoleon III showed his prefect of the Seine, Georges-Eugène Haussmann, a map of Paris, and instructed him to aérer, unifier, et embellir—let the city breathe, unite it, and embellish it. Haussmann transformed the Paris that Balzac described into the Paris we know today, one where wide, tree-lined boulevards lead the eye to neoclassical monuments, to grand mansions made of cream marble and limestone, to spectacular fountains and manicured gardens. The great cathedrals became the jewels in an urban charm bracelet of gilded statues, golden ornaments, winking gargoyles, flirtatious nymphs, and pudgy cherubs. In the evening, moonlight sparkles over the gossamer spires and steeples and glitters in the Seine; young lovers gather on the arched bridges to take tender selfies and post them promptly to Instagram. Paris is one of the world’s most visited cities, welcoming as many as 30 million tourists annually—a major engine of its economy—and this is the Paris that they are coming to see, not one of Godzilla-size wedges. Paris was more beautiful after Haussmann’s spectacular act of “rupture,” as Hidalgo would put it, than before. The aesthetic explanation is no mystery: if Haussmann was unaware that Paris had once been a great Roman city, he had nonetheless thoroughly internalized and mastered the classical idiom. In the first century AD, the Roman architect Vitruvius composed The Ten Books of Architecture. The so-called Vitruvian Triad—firmitas, utilitas, venustas—has been respected by every successful architect in Parisian history and neglected by every unsuccessful one. Firmitas: Is it sturdy? Utilitas: Is it useful? Venustas: Is it beautiful? Since the Roman era, the city’s great buildings had evoked the ancient world, with its emphasis on symmetry and proportion. Both the Church and the Crown used their influence and patronage to encourage building in this tradition, and all the major styles of Parisian architecture—Gallo-Roman, Merovingian, Carolingian, Romanesque, Gothic, Renaissance, baroque, rococo, neoclassical, Haussmannian, beaux-arts—are dialects of the same ancient architectural language. Paris owes its beauty to a balance between variety—provided by the dialects and embellishments of various architects and their patrons—and the continuity of the architectural principles that were believed, until very recently, to be objectively correct and timeless. This underlying aesthetic remained in place until after World War II, when architects such as Marcel Breuer and Henry Bernard erected the city’s first major modernist works. Modern Paris’s precursor, Lutetia, was founded on what is now the Ile de la Cité and the Seine’s Left Bank; the neighborhood is still called the Latin Quarter. When the Roman Empire collapsed in the fifth century, so did Lutetia. By the outset of the Middle Ages, it was gone. In rebuilding the city’s sewers and installing gas pipes for lamps, Haussmann discovered its past. We would otherwise know of Lutetia only from such hints as Caesar’s description in his Commentaries on the Gallic Wars. As Haussmann built the new city, the archaeologist Théodore Vacquer excavated the old one, bequeathing to the public, on his death, archives of some 10,000 photographs, sketches, printed fragments, and handwritten manuscripts describing it. From these, we know of Lutetia’s forum and its aqueducts, the frigidarium and caldarium of its public baths, its temples, and its necropolis. It’s tempting to attribute the destruction wrought by postwar Parisian architects to their vanity and contempt for history. But vanity and indifference to history were no impediment to Haussmann. He took a glance at the relics of a city that had been buried more than a thousand years, and with a wave of his hand promptly buried them again—this time, for good. The amphitheater was demolished to make way for a bus stop. If the relics themselves left him unmoved, however, the theories and rules that had governed their creation did not. Public and private buildings thereafter conformed to a unified design convention and adhered strictly to the principles of Roman architecture—the theories and rules taught at the Académie Royale d’Architecture, founded in 1671. The Romans’ approach to urban planning was systematic: they built cities in rectilinear grids, with public spaces and wide, triumphalist roadways leading the eye to monuments of power. Haussmann’s model was Rome itself. In their proportions, Roman buildings look much like Greek and Etruscan ones—horizontal structures supported by columns—but with distinct innovations: the Romans used new materials, quarried from the farthest reaches of the empire, and discovered that limestone could be used to make concrete, a material strong enough to support massive spans, basilicas, and triumphal arches. Inspired by their Eastern conquests, they incorporated new decorative elements—papyrus leaves, for example—as well as sculptured pedestals, street colonnades, and ornamental fountains. What the Romans saw, and what contemporary architects cannot see, was that their new technical abilities need not always be put to use—they could now build without columns, for example, but this did not entail that they should. They understood the language-like properties of buildings and urban planning, and saw that columns, by means of their inherent properties or through familiarity and tradition, signified power and grandeur. The purely decorative columns on Roman buildings are key rhetorical elements of an architectural language that says, “Only we, a great imperial power, possess the wealth, the skill, and the audacity to produce such grand and solemn edifices.” Around the world, the language of classical architecture is still understood, intuitively, to mean precisely this, because there is an inherent meaning to these shapes and proportions or because sooner or later, everyone in the world was colonized by the Romans or by those whom the Romans had colonized. During the Middle Ages, with the Roman Empire’s collapse, Paris was unleashed from the strictly classical idiom. Buildings were slapped together haphazardly and streets unplanned. The French socialist Victor Considérant described the outcome as “a workshop of putrefaction, where misery, pestilence, and sickness work in concert, where sunlight and air rarely penetrate.” Still, the few gabled houses that survive from this period are pleasant to the eye, of human scale, and simple, though not devoid of ornament. The great cathedrals of the high- and late-medieval period are, of course, among humanity’s great achievements. They represent a harmonious transition from late Romanesque architecture, which was directly derived—as the name suggests—from the Romans. The key medieval innovations were structural: buildings began soaring heavenward through the use of pointed arches, which bear weight better than round ones; flying buttresses, which transfer weight from the walls to the ground; and ribbed vaults, which structurally reinforce ceilings. These weight-bearing skeletons permitted for the first time the installation of enormous, intricately detailed stained-glass windows depicting narratives from the Bible. Since few medievals could read, these windows were the Word, written in light. 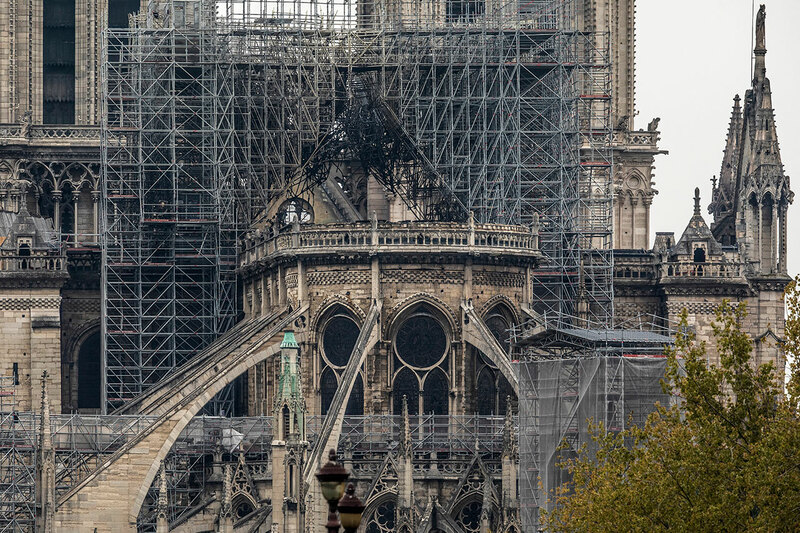 The men who built the Cathedral of Notre Dame were avid students of the Greeks and the Romans and, like their classical forebears, obsessed with perfect proportion. The medieval priests seized upon the idea that the supreme beauty of the universe was based on perfect ratios and ideal numbers. The cathedrals were indeed taller than the buildings around them but not disproportionately so. These buildings spoke a language universally understood. The eye is drawn heavenward for a reason, and likewise, there is a reason that the church stands literally above all else, at the center of city life. Paris is still beautiful, but God knows the architects are doing their best to ruin it. The outskirts have been destroyed, and the center has been compromised. No architect working since the end of World War II has added to the city’s beauty; every one of them has detracted from it. The new buildings aroused universal condemnation at their inception; only familiarity made them tolerable. That postwar architects cannot make anything beautiful is so widely understood to be true that no one bothers to ask why they cannot. It is just an aspect of modern living, like air travel and the Internet. Urban architecture has not declined because modern democracies can’t afford to build attractive buildings: the Triangle Tower will cost $720 million. It would not cost dramatically more, and would certainly be more popular, to build replicas of well-liked Parisian landmarks, as has been done, in fact, in Tianduchang, on the outskirts of Shanghai. 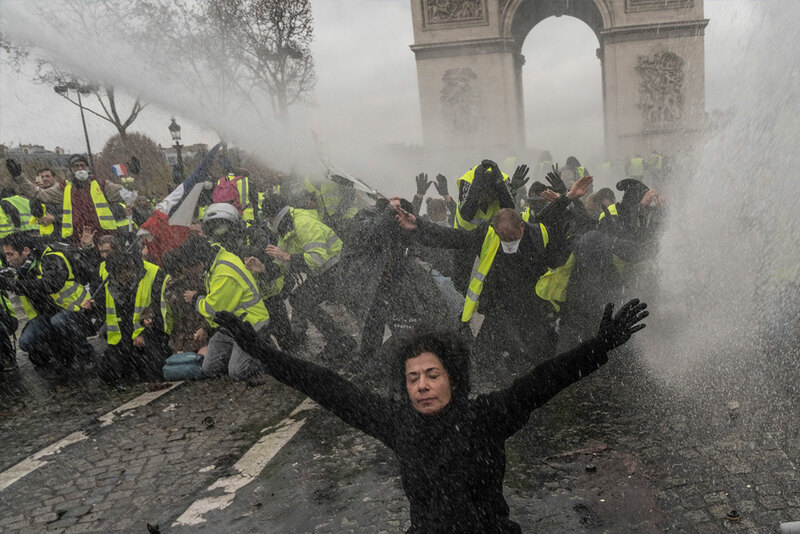 France’s per-capita GNP in the seventeenth century was about $1,875, says economic historian Angus Maddison; the country is now 22 times wealthier. The argument that France is too poor to build attractive buildings makes no sense—still less because of its improved labor productivity, engineering techniques, and access to materials. 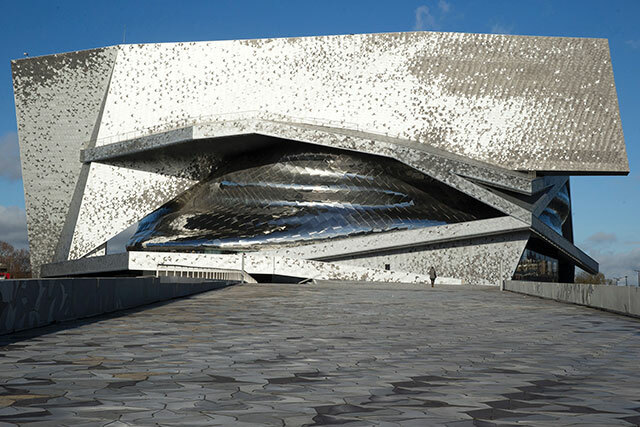 Indeed, the modern buildings tend to be stunningly expensive and wasteful: Jean Nouvel’s Philharmonie de Paris, for example, is probably the costliest concert hall in history. Commissioned in 2006 by the French Senate, its estimated budget was 170 million euros. Though scheduled to open in 2012, it was still unfinished in 2014—and more than 200 million euros over budget. By that point, it was obvious that the thing would always look like an abandoned Klingon imperial outpost. The Senate pulled the plug on further funding. Nouvel boycotted the hall’s opening in January 2015, insisting that it was ugly because the Senate had refused to spend even more money on it. If it’s unclear why modern architecture must be so offensive, it’s particularly puzzling why French architecture must be. Why would a people surrounded by superior exemplars adopt the worst of a modern international style? Inevitably, the new buildings are justified with the same refrain: Paris cannot be a museum; it must be modern. But those who say this offer no real idea about what “modern” is, or should be, beyond “perhaps like New York.” If Parisians truly wished to emulate New York’s dynamism, they would start by examining its economy, not its architecture. It cannot even be said of modern buildings that, like modern pop music, they are obviously meretricious but widely beloved. These buildings are loathed. Modernist buildings send nearby property values plummeting; neighborhood crime rockets, and morbidity and mortality rates rise, too. No, this is not because such buildings are “affordable.” Drug dealers, pickpockets, and voyous have to commute from the affordable outskirts of the city to loiter around the Pompidou Center, the ugliness of which has been evoked by so many before me that I won’t bother to present new denouncements. The derelicts know, somehow, that it was meant for them. The concentration of dispiriting modernism reaches its height in the banlieues. Contrary to legend, these ugly suburbs are not manifestly hellish; nor are they governed by Islamic law; nor are they too dangerous to enter. But they are very ugly. I visited Gennevilliers shortly after the attack on Charlie Hebdo, looking for insight into the milieu in which the terrorist Chérif Kouachi grew up. I found little. A banner said, “Gennevilliers is united against barbarity and for freedom of expression,” but that was the only hint that anyone there might think otherwise. It has a clean and modern cultural center, named for an obscure French-Caribbean writer, which offers activities such as artisanal chocolate tastings and manicure classes and is well stocked with markets and pharmacies. It looks to be a normal place, save for the mystery of its banal ugliness. Modernist experiments have damaged cities around the world, but nowhere more so than in Paris. The French Revolution had no malign effect on the city’s architecture. Even invasion by the Nazis failed to destroy the city’s beauty. The postwar architects were the only ones who thought that it would be a good idea to ruin it. If no theory, ultimately, suffices to account for this newborn taste for architectural vandalism, some are at least suggestive. Perhaps the catastrophe of World War II filled France with so much self-doubt as to make Le Corbusier’s malign vision seem something other than grotesque. Le Corbusier after World War I described France’s architectural heritage as “deflowered.” World War II, it seems, convinced French planners that, having lost its innocence, France’s heritage deserved to be raped. 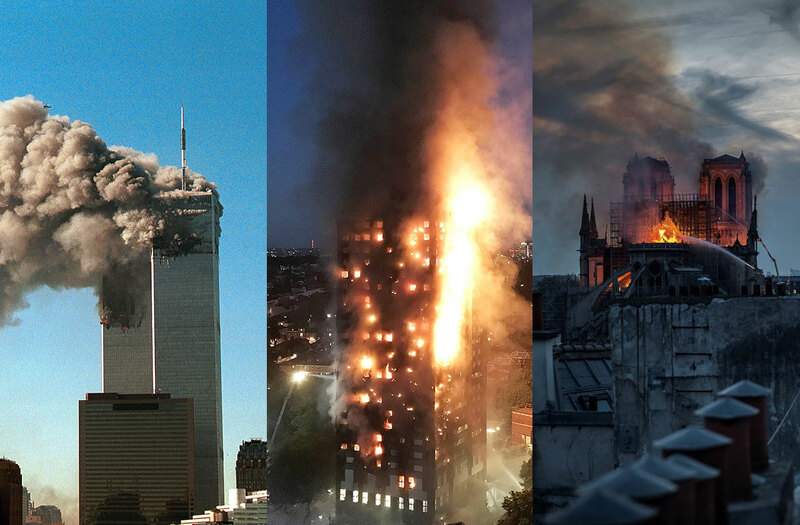 Paris remains one of the noblest ornaments of the world, but the destruction of its center is a work in progress. Each president of the Fifth Republic sought to leave a mark on Paris, and each initiated a plan of grands travaux—great works—each of which made it worse. Charles de Gaulle’s legacy on the city center, at least, was largely inoffensive. He reserved his pharaonic impulses for other priorities: forestalling a coup and developing an independent nuclear deterrent. But by the end of the 1960s, redevelopment had become synonymous with corrupt realty speculation, secret decision making, and collusion between France’s semipublic companies and its technocratic central planners. 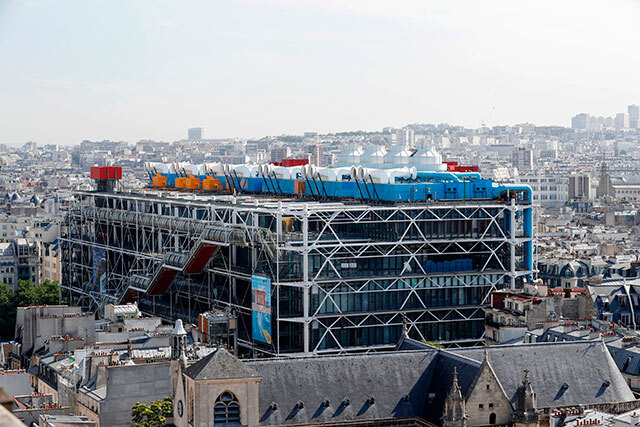 The tendrils of rot blossomed under President Georges Pompidou, elected in 1969, the same year that construction began on the Montparnasse Tower, a high-rise of such menacing ugliness that it has become a landmark. Everyone assumes that bribery and graft hastened its creation—it’s too awful to imagine that a man in possession of the nuclear codes earnestly thought it a good idea. Tourists are fascinated by its bleak destructive power. The Montparnasse Tower is particularly tragic in its effect upon the Jardin du Luxembourg, the most beautiful of urban gardens, a masterpiece of sensitive and inviting design. Its lawns, tree-lined promenades, and flower beds are carefully cultivated. It offers a charming little bois with outdoor restaurants, a reflecting pool where French children still push-stick little boats amid paddling ducks, an orchard of apple and pear trees, a vintage carousel, and a broad esplanade, inviting to lovers and picnickers. To the west of the garden are the stately buildings of the Senate, a museum, a gravel footpath, and labeled trees. Visible from every corner of the park, though, is the thing—the Montparnasse Tower. Roughly the height of the Eiffel Tower, it is still—for now—the only skyscraper in Paris. The Montparnasse Tower is not alone, however, among the Pompidou era’s bleak monuments. Though not a true skyscraper, at just 13 stories, the Zamansky Tower of the University of Paris’s Jussieu campus is another achievement in ugliness. Planned in the 1960s and built in 1970, the tower was designed for students too impotent to object and faculty too foolish to know better. University officials worked together with the Ministry of Education on the plans. They were proud of the result. 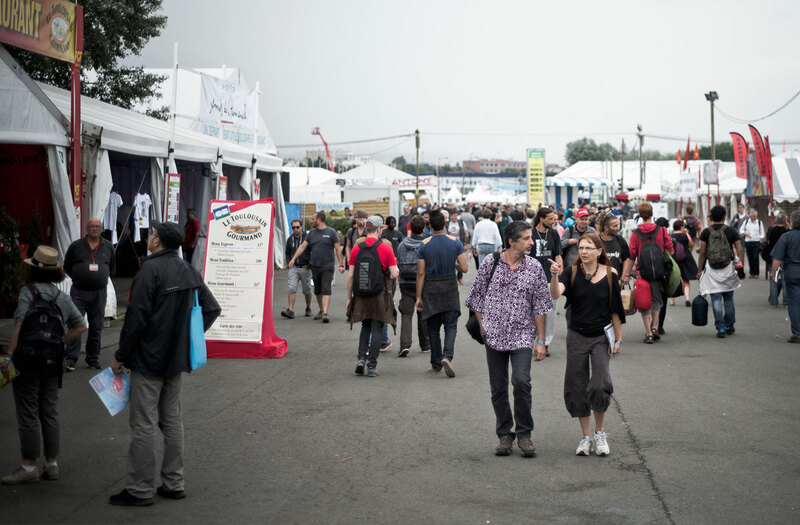 The university had taken over a considerable space previously devoted to a lovely wine market. Occupying the entire square, it comprises a series of smaller towers, with the larger tower rising to one side. The square drains poorly and floods in the winter. The building lacks sufficient elevators, and those in service work poorly. Windows won’t open. In the hallways, pigeons flap from one pillar to another. It looks like a concentration camp. It was, in fact, designed by a Holocaust survivor and a victim of the camps. It is understandable that he was unable to expunge this memory from his mind; it is not understandable that he was encouraged to re-create it in the heart of Paris. Pompidou’s reign of error gave rise to François Mitterrand’s Fructidor. Mitterand’s Grandes Operations d’Architecture et d’Urbanisme was his program to build eight “monumental” buildings in Paris; these were to symbolize Socialist Party politics, of which he was the embodiment, and exhibit France’s stature at the end of the twentieth century. While the scale and cost of the effort evoked comparisons with Louis XIV, it’s notable that not one of the individual projects—the Louvre Pyramid, the Parc de la Villette, the Arab World Institute, the Opéra Bastille, the Grande Arche de la Défense, the Ministry of Finance, or the Bibliothèque Nationale—would have been out of place in Miami, Dubai, Shanghai, or Sydney. Only in a handful of cities would such buildings make no sense. One of them is Paris. Not only are these buildings ugly; they also do not succeed even in achieving the architects’ justification for the ugliness: originality. Consider, for example, the Louvre Pyramid, commissioned by Mitterrand in 1984, which now occupies the Napoleon courtyard that had been as empty as its original designers intended it to be. The original seventeenth-century courtyard was meant to interpose a space between the somber facades of the museum; later, it opened an unblocked view from the Louvre to the Arc de Triomphe, nearly two and a half miles away. Seeking someone who by instinct and training would properly appreciate the uniquely French character of both the buildings and the urban landscape, the Mitterrand government inexplicably turned to the Chinese-American architect I. M. Pei. When plans for the pyramid were announced, architectural critics at Le Monde declared it a monument to bad taste and suggested that it belonged in Disney World. The criticism is misplaced, and suggests that even the vocabulary of French architectural criticism has been emptied. The Pei pyramid is an expensive and impressively engineered piece of work, not tacky in materials or execution. It has characteristics associated with the French architectural tradition: showiness and a love of reflective surfaces. What is curious about the pyramid is the sense of familiarity that it evokes: it looks like an Apple store. Like so many modernist buildings, the Pei pyramid conveys the impression of elegance by means of expensive material. The modernists hated ornament, which they defined as something that the building does not need. 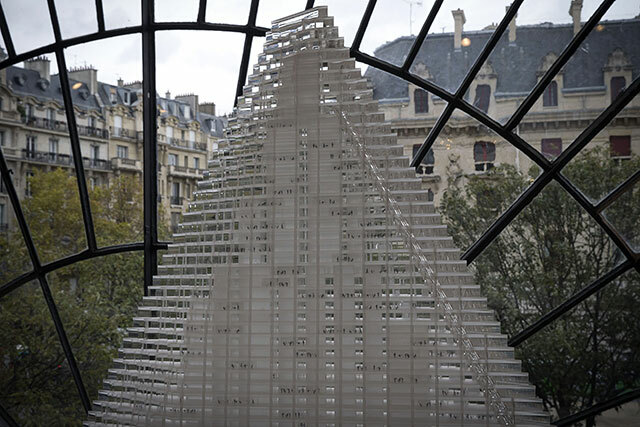 The Pei pyramid’s “ornaments” are the color and the refractive index of its glass. Were we to build exactly the same structure with cheap, industrial-grade glass, the result would be clearly vulgar and drab. A good building can survive a withdrawal of its ornaments while still expressing the same architectural form and projecting the same sense of drama, usefulness, and beauty. The Pei pyramid cannot meet this test. Its ornamentation is intrinsic and can’t be withdrawn without a radical revision in one’s opinion of the building—a good reason to think the building defective. What’s most striking about the Pei pyramid is what’s least often observed: it is by far the best of the modern French buildings. It is still awful. 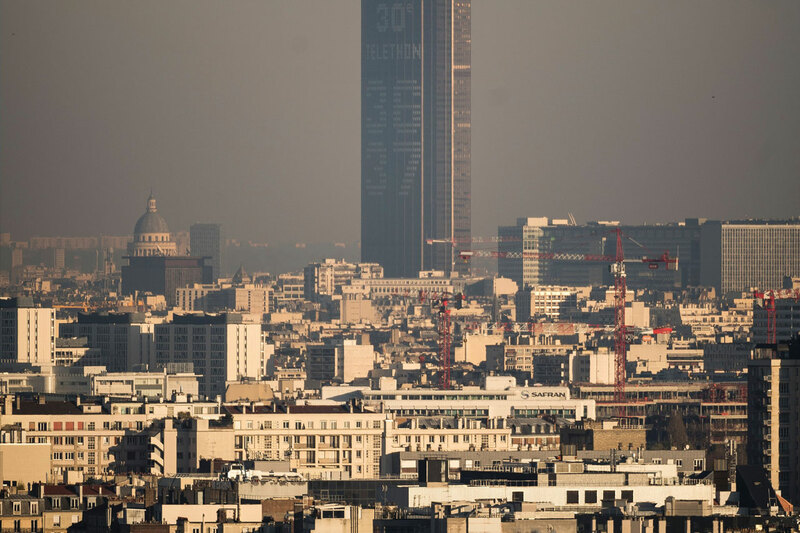 During her campaign, NKM hinted that she would raze the Montparnasse Tower. Hidalgo reminded voters that only the tower’s 300 owners could make such a decision—not likely, as they enjoy the only view of Paris unspoiled by it. After the tower was completed, Parisians were so outraged at the destruction of their skyline that they banned high-rise buildings in the city center. In 2008, the Socialist Party pushed a resolution through the city council to permit them again. Now, alas, Paris confronts the prospect of performing more masochistic experiments on itself. 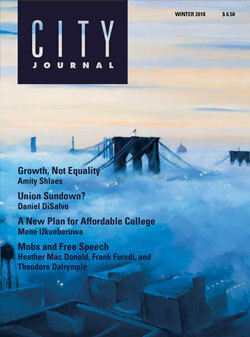 It is true that the city can’t remain pickled in aspic if it is to be a thriving center of economic life; new things must be built, as they must everywhere. The problem—and the mystery—is that no one seems able anymore, like Haussmann, to build something at once new, firm, useful, and beautiful. Anyone considering the 23 winning proposals of Hidalgo’s contest to “reinvent” Paris must confront these two queer facts: French architects are awful, and French leaders have no taste. This is a dangerous combination. Claire Berlinski, a City Journal contributing editor, is an American journalist who lives in Paris. She is the author of There Is No Alternative: Why Margaret Thatcher Matters.